Israel has shut the main cargo crossing with the Gaza Strip in retaliation for arson attacks by Palestinians and attempts to infiltrate its territory. Only "humanitarian equipment", including food and medicine, will now be allowed through Kerem Shalom. Israeli Prime Minister Benjamin Netanyahu vowed to use a "heavy hand" against the Palestinian militant group Hamas, which dominates Gaza. A Hamas spokesman called the Israeli move "a new crime against humanity". 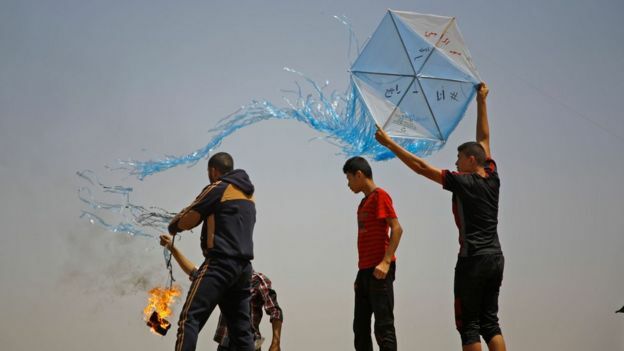 Palestinians have been launching kites and balloons carrying containers of burning fuel and explosive devices over the Gaza-Israel border since April. 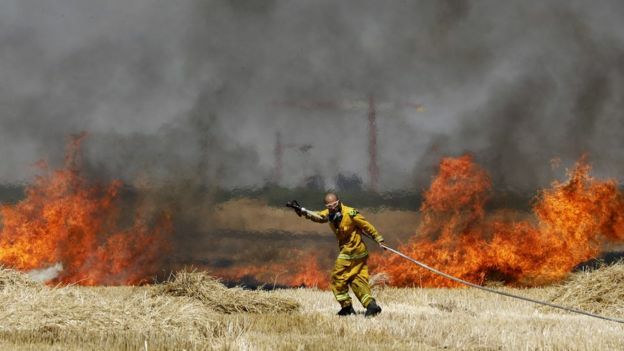 The devices have sparked 750 fires in southern Israel, burning more than 2,600 hectares (6,400 acres) of forest and farmland and causing hundreds of thousands of dollars of damage, Israeli officials say. The arson attacks began during mass demonstrations along the border, at which thousands of Palestinians have expressed their support for the declared right of Palestinian refugees to return to their ancestral homes in what is now Israel and also demanded an end to the blockade of Gaza imposed by Israel and Egypt. Gaza health officials say more than 130 Palestinians have been killed and 15,000 others injured by Israeli forces during the protests. Human rights groups have accused Israeli troops of using excessive force. Israel has said they have only opened fire in self-defence or on people trying to infiltrate its territory under the cover of the protests. Israel's military said the prime minister had ordered the closure of Kerem Shalom on Monday "in light of the ongoing arson terror and additional terror attempts, led by the Hamas terror organization". The military will also stop Gaza's fishermen sailing more than six nautical miles (11 km) offshore in the Mediterranean Sea, after having extended the limit to nine miles (17km) for the past three months. Mr Netanyahu said he and Defence Minister Avigdor Lieberman had agreed to be "heavy-handed with the Hamas regime in the Gaza Strip - immediately". "There will be additional steps. I will not go into details," he added. Hamas, which has fought three wars with Israel since 2008, called on the international community to intervene immediately to prevent what it called a "new crime against humanity". The Israeli non-governmental organisation Gisha, which promotes freedom of movement for Palestinians, also condemned the Israeli decision. "The damage being caused to agricultural lands in Israel is grave and deplorable, but collectively punishing nearly two million people in Gaza by closing its only official crossing for the movement of goods is both illegal and morally depraved," it wrote on Twitter. Almost all of the goods imported to Gaza pass through Kerem Shalom. The United Nations says 43,087 lorryloads of goods arrived through the crossing in the first five months of 2018. In May, 44% of the lorryloads carried construction materials; 29% food products; and 1% medical supplies.